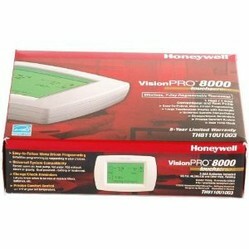 Basically the Honeywell TH8110U1003 Vision Pro 8000 Digital Thermostat is a 7 day programmable appliance. Therefore, each day would have it's own cooling/heating schedule, unlike the two day programmable thermostats wherein weekdays all have a fixed schedule and weekends have one of their own. Since no ones life works like clockwork, it would be advisable that you go ahead and choose this or another 7 day programmable thermostat as you wouldn't have to worry about your home cooling itself down when you're not at home. It's got a digital display which makes it easy to read under all lighting conditions; moreover, the device works on a touch screen which makes it easy to use. Since there are no buttons whatsoever, it would suit all kinds of interior decor. Another reason as to why you wouldn't have to worry when you get this installed is the fact that it has reminders to warn you of a low battery - so, your home won't be neglected. Some of the other devices of all brands including Honeywell don't inform you about the filters and batteries which cause a lot of problems if you aren't prepared. 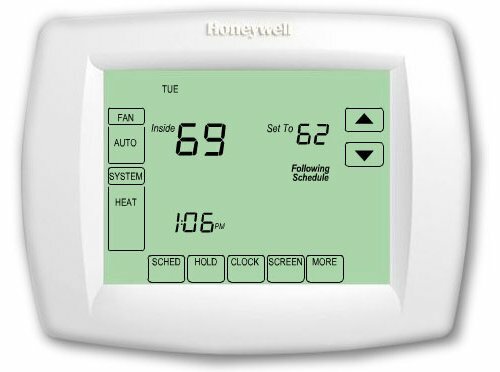 Is the Honeywell TH8110U1003 8000 Digital Thermostat the perfect choice? Automatic Switching over - Most homes need both heating as well as cooling to maintain a constant temperature. Most of the thermostats available in the industry need you to manually switch over from heating to cooling and vice versa. However, the Honeywell TH8110U1003 model has a mind of it's own thereby switching over so as to maintain your predetermined temperature. Easy Installation - Installation of this thermostat is really easy. If you're already familiar with the process of installing a thermostat you would be able to do it under five minutes. However, if it's your first time, make sure to go through the installation manual - everything is well explained. Easy programming - It's really easy to program the temperature requirements for all the days of the week. But, you need not worry - you can always change the settings if your plans change. Hold Feature - Most thermostats don't have the option of overriding the program for a long time. Usually you can just override for an hour or two. But, this model let's you completely take over when needed. This is really useful when you're off on a vacation or just got some unscheduled work to complete. Reminders - There are excellent reminders installed which would let you know whenever you need to service or replace the air filters, ultraviolet lamp, batteries as well as the humidifier pad. Daylight savings - Oh! the worries of daylight saving... Changing the clocks around the house is a real headache. But, this thermostat is truly a masterpiece which automatically adjusts itself to meet this schedule. Also, if at all for some reason there's a power failure. this device has an inbuilt real time clock that keeps track of the time. Touchscreen lock - If you don't want someone fiddling with the touchscreen while you're away (Usually young kids), there's an option to lock the keypad. Warranty and air quality - Usually thermostats and other electronic gadgets/appliances usually have a warranty of a single year. However, the Honeywell TH8110U1003 model has a warranty of a whopping 5 years! The company sure is confident about the quality. Moreover, if at all you connect the thermostat to your programmable fan, the whole house would have cleaner air as the circulation would be great plus the filters would work better - more air would pass through them. Does it possess all the features you need? There are plenty of benefits when it comes to using the Honeywell TH8110U1003 Model. But, there's a small drawback that could arise if you're not careful. The touch screen - If you own touchscreen phones you would know that after some years they tend to lose their touch a bit. The same applies here as well. Therefore, in order to prevent this from happening you should not use it too often; by too often I mean fiddling with it every time you step in the house. Other Alternatives to this model?